Play Lucky 88 pokie machine online for free! Inspired by the number 8, a popular number in the Chinese culture symbolizing luck and good fortune, the Lucky 88 pokie machine is a 5-reel 25-payline slot machine with the music, graphics, and fonts designed in the oriental style. The Lucky 88 pokies machine that you love playing in your local casino or gaming club is online right now and it is right below; click the free play button to get started. Lucky 88 the Magic of the Orient at Your Fingertips! Lucky 88 pokie game is finally available to online pokie players and brings all the magic and wonder of the Orient to the online gaming experience. This pokie features ancient palaces and mystical shamans as part of the interactive experience that Lucky 88 brings the player. The player will feel the quiet mystique of Asia upon pressing the first “spin” button. Aristocrat online games have brought another extraordinary pokie here with Lucky 88. Lucky 88 features all the interactive display that an experience player demands: line selection, denomination adjustment, free game bonuses and more. The versatility of Lucky 88 provides a maximum denomination for the daring pokie player of 4.0 units with a minimum of .03 units for the more conservative player. The “auto spin” button allows the player to determine whether they want to sit back and relax or have every spin at the touch of their fingertips. The player can select up to 500 spins with the option of stopping and adjusting denominations at any time. Also the player will find the ability to adjust the amount of lines that they prefer to play. The lines have a corresponding “Payline diagram” underneath the “info” tab on the home display. 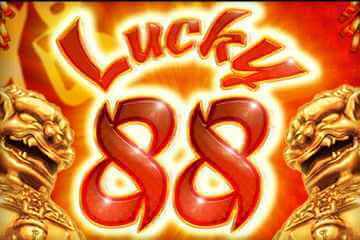 It is here that the player can better understand the rules and features of Lucky 88. Some features unique to this pokie are the option to choose your free games feature or roll your lucky dice. Selecting the “Extra Choice” option on the home display can enhance the free games feature. This allows the player to have extra winnings and free games if they are lucky enough to have three lamps land on their reel. The conditions for the extra choice option are the number of lines that the player must select and the minimum bet the player must use. The best part is the player can win more free games while in the free game option. One more feature unique to Lucky 88 is the ability for the player to roll their lucky dice. The dice option allows the player to enter an exciting feature where they can roll their dice for additional prizes. Thank you lucky lamps! The “gamble” feature, located at the bottom right of the home display, allows for the ambitious player to amplify their winnings. The player has to choose either “suit” or “red/black” for a combination of double or quadrupled winnings. The interactive combination of culture and design has made Lucky 88 an instant winner. The player will find that the streamlined layout of this pokie by Aristocrat is both practical and maneuverable – not to mention fun!